The Zoo is an amazing place to take pictures - please enjoy this small album of shots I took at the Magnetic Hill Zoo in Moncton. Set your camera to "single spot auto-focus". Surprisingly, not all cameras have this - my EOS 400D didn't have it until I installed a Firmware Hack. Fortunately, the 7D and the 40D which recently died on me both have Spot AF, as it's commonly referred to. 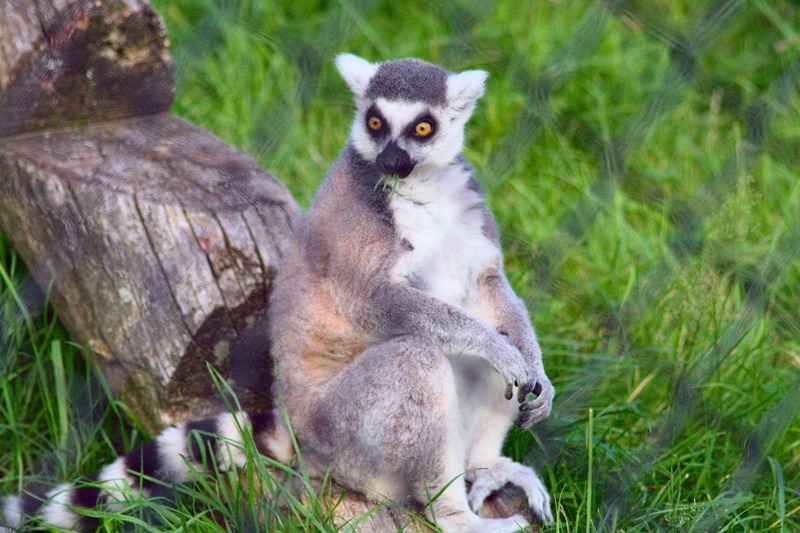 For this shot I placed the Spot (as seen in the Viewfinder) on the Lemur's body, right dead centre in the photo, and my lens clearly focused on him and not the fence. I then quickly hit the Focus Lock button and took the shot. Use the Aperture Priority Mode, and set the Aperture to f8 -this will give a reasonable depth of field to maintain a reasonable focus on the moving animal, but take care that your shutter speed will be correspondingly slower, and if slow enough, will cause a lot of motion blur. You will have to compensate for this by setting your ISO (sensitivity to light) to a high (1600 or greater) value, which will allow your shutter to be fast enough to freeze all the motion. There now - I just gave you a practical application of the Spotmatic basics, except with the Spotmatic, you can't just change your ISO - you're stuck with the ISO of the film in the camera, which was usually "back in the day" no greater than 400 for colour. A better solution is to set your camera to "follow focus" - that is to stay in focus as you follow the moving creature around. (Canon DSLR's call this the AI-Servo Mode - other cameras would have a different name for it). At the same time, you could have your camera in Burst Mode (taking a timed sequence of shots as long as you press and hold down the shutter). Now, the problem with this overall approach, once again is the fencing. As you attempt to follow the animal's movement, the Auto Focus, even when set on Spot AF, will periodically focus on the fence instead of the critter. Most AF's these days, on DSLRs are lightening quick, so if you are burst shooting, you will probably get some shots with the animal, and not the fence, in focus. This cannot be said about most Compact Digi-Cams however, which still suffer from somewhat delayed auto-focussing, as well as shutter lag. In which case, it is probably better to use suggestion #1, except that Compacts, with their extremely small sensors, don't work very well at ISO's greater than 400 - you'll still get a picture, but it will have a lot of noise (speckles) in it. Conclusion - even though DSLR's are bigger and heavier than Compacts, they work far better at the zoo, or anywhere else that fast action is required. This is why we buy them. Car Show and the Day Linux Failed Me! Frame Size - Does It Matter?